We started our first trading company in 1969. From that time to the present our enjoyment of turquoise has never ended. Today we own three turquoise mines in Nevada and offer here the finest natural turquoise cabochons and hand-cut beads available for the jeweler and the collector. The rough turquoise that is used to cut our cabs and beads comes directly from the turquoise mines that are still in operation today. All 100% natural and free of any treatments. The Fox, Darling Darlene, Drycreek, Godber-Burnham, Easter Blue, Morenci, Number 8, Pilot Mountain/Montezuma, Royston and Stone Mountain all come directly from past or present mine owners. The Persian is from a turquoise collection from the 1960’s and the Tibetan cabs are cut from antique turquoise beads over 200 years old. Many of the other cabs come from some of the finest collections of the last 100 years. 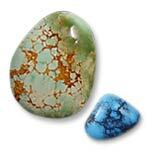 We sell only the finest all natural, high-grade turquoise stones available. Although chemically just a hydrated phosphate of copper and aluminum, turquoise with its beautiful range of blue-green colors has stirred a passion in people of different cultures for centuries. Turquoise has been found in Egyptian tombs, it has been used in early Persia (Iran), Tibet and China. In our own Southwest, turquoise mines have been worked by Native Americans long before the birth of Christ. Turquoise with its many colors and varieties is considered one of the finest gemstones and like the people who wear it each piece is just as individual. This is only a small offering of what is available. If you have any questions about a certain cabochon or bead please send us an email. © Copyright 2017 Nevada Gem. All rights reserved. Website design by YK Design.